No need to worry if you have exact change for the bus, or whether you have to buy separate tickets for the tram and the bus. The Robin Hood card offers a cashless and convenient alternative. We are working in partnership with the other councils and the different bus, tram and train operators to provide an integrated public transport network. 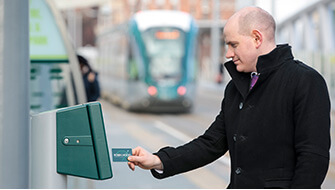 The Robin Hood card is a smart, simple and cost effective way to pay for multi operator journeys. You can purchase a pay as you go card for just £2 from one of over 130 machines across the city. Simply top it up and hop on board! If you travel on a mutli-operator route regularly and would like to purchase a season ticket visit our travel centre in the Victoria bus station. Visit the Robin Hood card website for more information. Visit the Robin Hood Network website to get your card and find out how you can save money on travel in the city.